Karting is, first and foremost, fantastic fun. It’s also a challenge – both against yourself to beat your fastest lap, and also against the other drivers that you’re trying to beat. When starting out there are a few key things that you need to remember which will help you get up to race pace faster than everyone else. When it comes to cornering, remember ‘in slow, out fast’. Get your braking done early so that you can accelerate out of the corner. Remember to always brake in a straight line so that when you’re in the corner you’re able to control the speed with the throttle. If you try and brake midway through a corner chances are that you’ll spin. If you feel yourself sliding, don’t panic and hit the brake. Instead, lift off the throttle and steer into the slide – this will allow you to control the kart by taking off some speed (which is far better than ending up going backwards!). Remember to think about the racing line. This usually involves going wide into a corner so that you can carry the most speed through the middle of the corner (apex) and exit at a higher pace. Most tracks will have a diagram of the racing line, so don’t forget to look at that first. The accelerator isn’t an ‘on / off’ switch. You need to ease the power on instead of just flooring the throttle – especially if the track is wet or slippery. Following on from those tips, remember that the first time you get in a kart you’re almost certainly going to have a spin or two simply because you don’t know what the grip levels are. To minimise this try to build up your speed by doing the first couple of laps slowly, and then picking up the pace as you gain confidence. 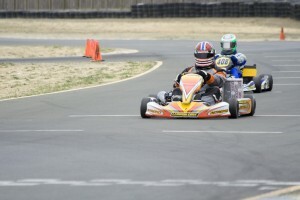 It goes without saying that cornering is the most important part of racing a go kart. As mentioned early, it’s important to brake before you enter a corner and then maintain pace through the apex, before accelerating out. Try to brake later and later each time until you’re right at the limit – looking for marks on the track to help guide your braking points will help keep this consistent but don’t be afraid to push the boundaries – a spin here and there is fine if you eventually gain a few seconds each lap. This is actually really easy – the thing that holds most people back is fear. Will I spin? Am I going to crash? Fortunately, there are some great ways to remove that fear and make sure that when you overtake someone you do it cleanly and with as little risk as possible. Firstly, remember that if you’re about to overtake it’s because your faster than the person in front. Watch how they’re driving and look for weak spots. Are they going slowly through a certain corner? Is there a part of the track that you think you can easily get past them? If you’re right behind them the answer is almost certainly yes. Decide which corner you’re going to use to overtake them and build up to it. Most of the time you’ll want to place your kart on the inside of the corner, brake later than the other driver, and then use the advantage you have to force them to slow down and then accelerate faster than they do when you leave the corner. Remember that once you’re up the inside, you have the advantage. Oh, and do your best not to crash into them as you’ll risk getting a black flag if you do. It’s better to back out of a move than end up with a penalty! The mistake that lots of beginners make is treating qualifying as a race. Overtaking, by definition, will lose you at least a small amount of time so try to find a gap in the traffic. Keep an eye out behind you, back off from the person in front, and then use the space to put in a blinding lap. Karting in the wet is a completely different experience. You’ll need to look for grippy parts of the track, which tend to be the least used areas. Going around the outside of a corner, looking for more jagged parts of the tarmac, or being sneaky and using concrets sections at the edge of the track are all great ways to grab yourself some extra speed!